If any of you are looking for the perfect finishing touch to your Father’s Day presents then this post is for you! I always like to send out handmade cards whenever I can, but I always stumble a bit when it comes to the men in my life. I saw these in Martha Stewart Living a few year’s back but then instructions were very vague and misleading, and with no pictures it was nearly impossible. After watching a couple YouTube videos about similar folding, I figured it out and thought this would be a fun post to share. The best part is that there are so many decorative papers out there that really do look like men’s dress shirt fabric which makes this all the more fun! Start by cutting your paper to size (and be sure to use decorative paper and not card stock otherwise it will be too thick to fold). I got all of these in the scrapbooking section at Joann Fabric’s and they were 12″ x 12″ originally, I cut off a 3.5″ strip to make it 12″ x 8.5″. 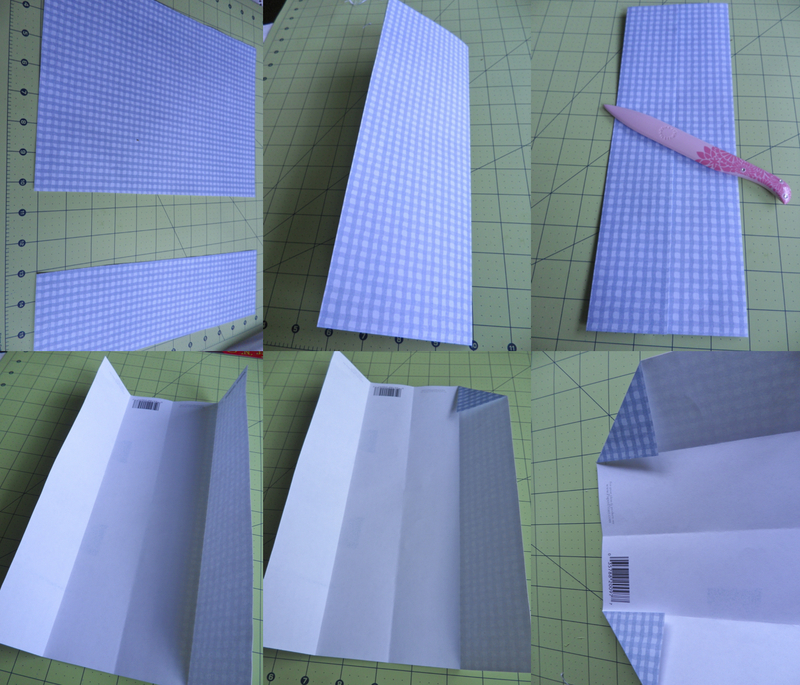 With the right side down, fold the paper in half vertically using a bone folder if you have one to get a good crease. Unfold and then fold each side into the middle crease. Unfold and lay flat, now you’ll have 3 creases in your paper. At the top of one end, fold each corner into the outermost creases. Here’s where it gets a little tricky to explain, so follow the pictures. You want to take the two outer corners of the triangles that you just made. 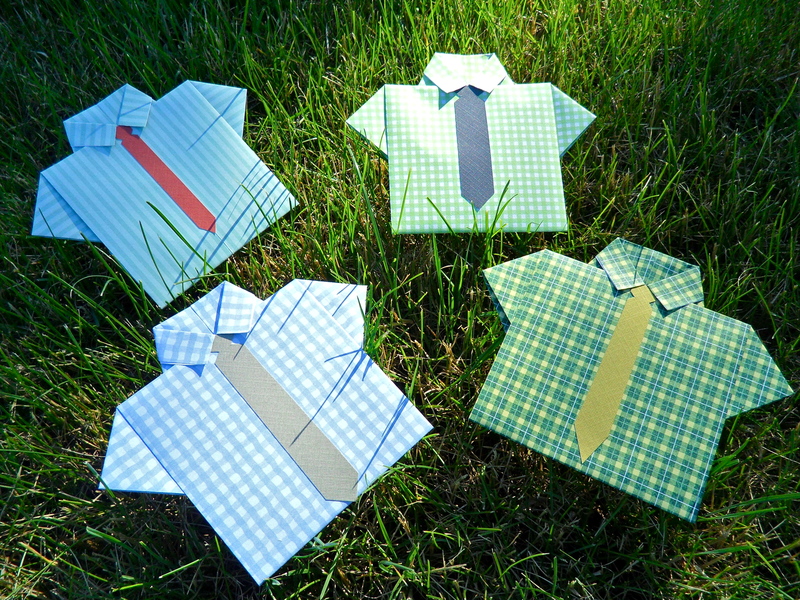 Fold them into one another and crease in the middle of the triangle just to the outermost crease in your paper. This is creating your “sleeves” The paper will pretty much fold on it’s own where it’s supposed to go now but you want to fold the top with the sleeves down towards you. (Again, it’s nearly impossible to explain so just follow the pictures). 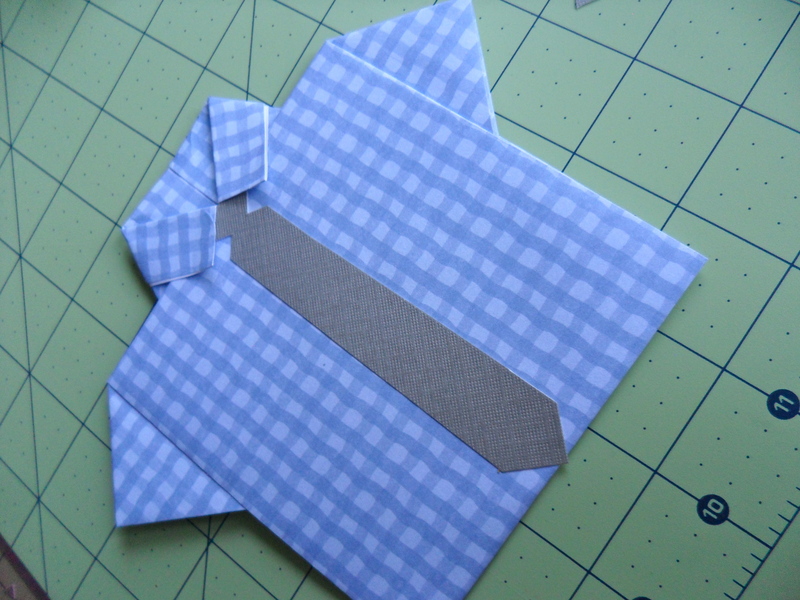 Flip the paper over and fold up about 1/2″ on the end opposite the sleeves. Flip the paper back over and fold each side of that end into the center like shown in the picture below. This will make your “collar”. 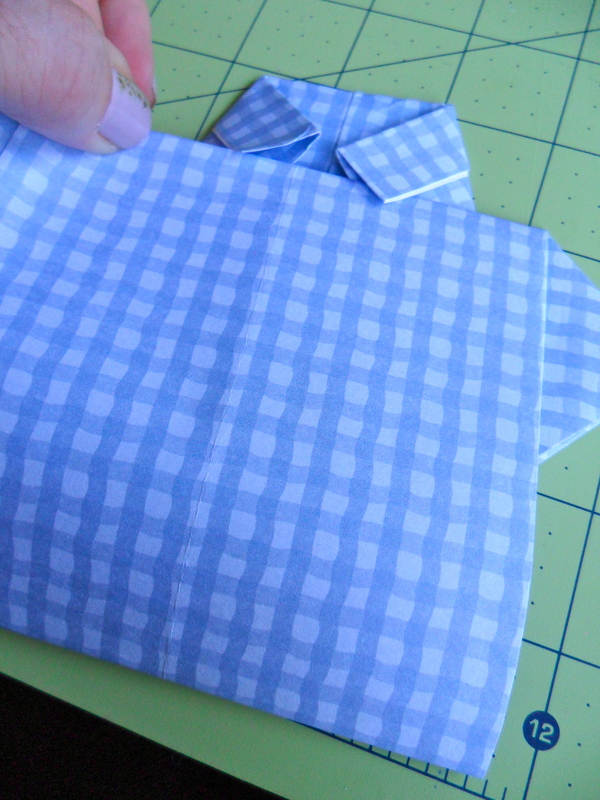 Now fold your sleeves end up under your collar end and crease. To ensure this stays in place, I used double-stick tape underneath. They make “Matte Stacks” now with adhesive backing so I cut a tie shape out of that and just stuck it right onto the “shirt”. The cards don’t open so you can write your message on the front of the shirt or the back, which is what I did. If the paper you used is too dark to write on, just cut a square of the adhesive matte stack paper and stick it to the back and write on that. Wishing all you dad’s out there (especially mine) a VERY happy father’s day… I hope you all have a great one!